None of the so-called “four treasures of the teahouse” can be dispensed with. 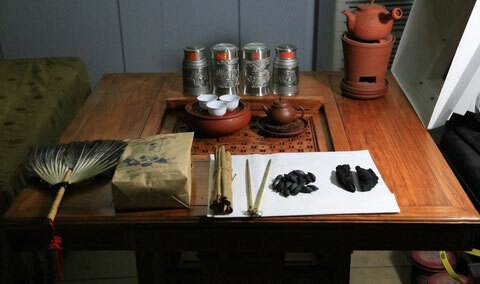 They are Yushu (Shiwei), Chaoshan Furnace, Mengchen Jar and Ruochen Cup. The Yushu (Shiwei) is a kettle for boiling water. It is an ochre flat thin-china kettle, with a fluid capacity of about 250 milliliters. When the water is boiling, the lid of the kettle will make a “pitapat” sound which sounds like a call for people to make tea. This kind of kettle is seldom used these days. Larger, dark-red enameled pottery kettles made in Yixing, usually in the shape of pumpkins or with a horizontal beam like handle, are frequently used in the common tea houses. The Chaoshan Furnace is a furnace for boiling water. It is small and exquisite, and the volume of air which it uses can be adjusted to control the intensity of its heat. Charcoal is its source of fuel. This kind of furnace is also not commonly used nowadays. Teahouses have three kinds of commonly used water boilers. 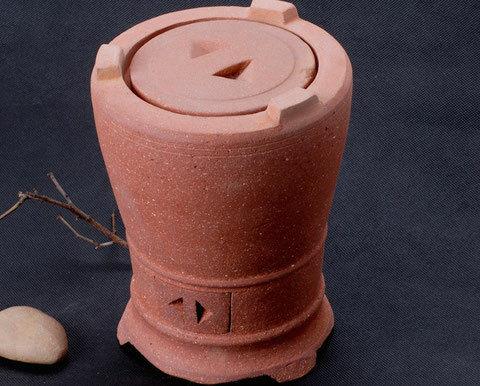 The first is a kind of small furnace which is made from purple sand. A small solid alcohol burner can be placed in the furnace. The furnace can be used for boiling water in conjunction with a large dark-red enameled pottery kettle. The second type is the electric heater which can preserve the heat and the stainless steel kettle on the electric hot plate. The other one is the magnetic induction heater with a glass stainless steel bottomed kettle placed on the induction panel. Of these three groups of furnaces and kettles, the furnace made from purple sand with a dark-red enamel pottery kettle has the greatest aesthetic value and is most suited for the purpose of tasting tea. However, they are relatively heavy and are not portable. The Mengchen Jar is the teapot for brewing tea. It is a Yixing dark-red enameled pot and the smaller it is the better it will be. 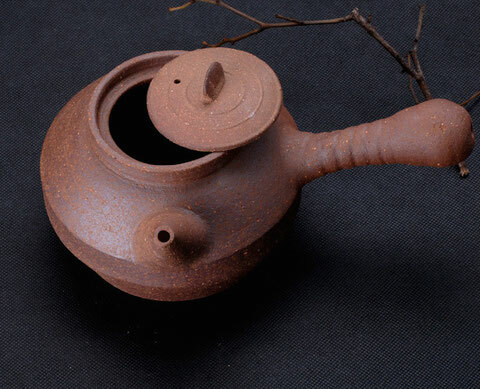 Mengchen refers to the teapot making master Hui Mengchen of the late Ming Dynasty and the early Qing Dynasty. The small teapots made by him are very famous. The size of a teapot corresponds to the number of people it is used to serve. In general, the small teapots with capacity of less than 300ml are commonly used. The Ruochen Cup is a small white porcelain teacup with reverse rim. It is small and shallow with approximately 10-20ml capacity. Presently there are two kinds of frequently used tea tasting cups (differing from the fragrance-smelling cup); one is the white porcelain cup and the other is dark-red enameled cup with a white porcelain interior. The tea plate and the tea tray: Tea plates on which the tea pot is placed are in the shape of plates and bowls. 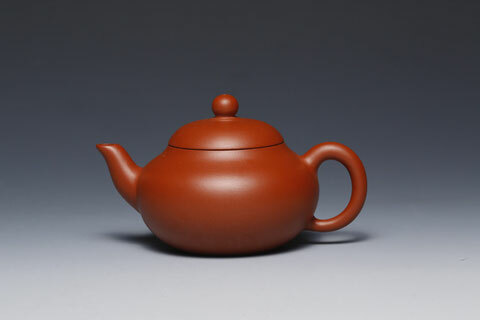 When holding hot water, they can be used for warming teapots and cups, as well as maintaining teapots. The tea tray is used for supporting teapots and cups. Commonly used tea trays unite the tea plate and tea tray as one, i.e. by placing the porous tea tray on the tea plate. 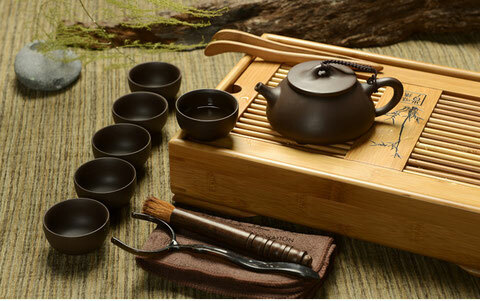 The tea tray owes its appearance to Oolong tea’s complex brewing process. At first, the cups and teapot shall be warmed. Each time after that the teapot shall be exposed to hot water when one is making Oolong tea. 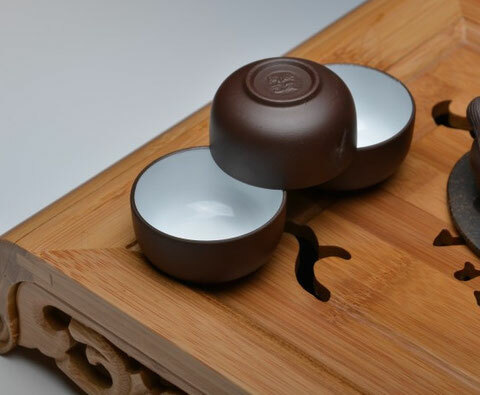 The double-tier tea tray allows for water to flow into the lower layer without staining the table. 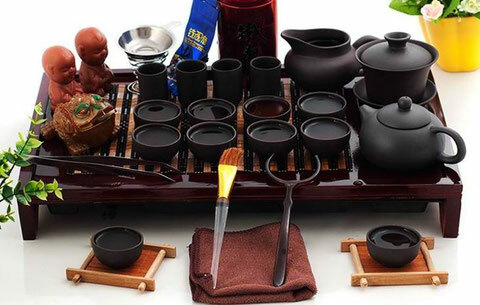 The textures of tea trays are different and popular ones are commonly made from purple sand and bamboo. Chahai (teapot) resembles an open teapot without a handle. The timing employed in making Oolong tea is very important and a difference of just a few seconds will affect the quality of tea water. Therefore, even during the dozen seconds when tea water is being poured from a tea pot, the tea water poured at first and that poured of at the end of the pot vary in tea flavor. In order to avoid the unevenness in gradation of tea flavor, all tea water should be poured into the Chahai and then poured into separate tea cups. In addition, the tea leaves and sediment has the chance to subside. Tea holders are made of porcelain and bamboo, mostly hemispheric and have a drainage opening. Tea holders are used for holding tea. One can appreciate the tea leaves in the holder before putting them in the tea pot. High-quality porcelain tea holders are arts works unto themselves. However, many tea houses do not use tea holders: this is a great pity. Fragrance-smelling cups are used for smelling the fragrance of a tea. They are long and thin and are specific to Oolong tea brewing. They are commonly used for making Taiwanese Oolong which has an intense fragrance. Matched with the tea tasting cups, fragrance-smelling cups are of the same texture. A fragrance-smelling set of cups is completed with matching saucers. Teaspoons are generally made of bamboo and boxwood these days. One end of the teaspoon which is used to add and remove tea leaves from the pot is bent. There is a great variety of accessories for tea sets including tea jars, tea clips, tea measuring tools and tea funnels; though they are not indispensable to the tea brewing process, so their details have not been included here. The comprehensibility to your set up is essentially extraordinary and I could think you are proficient in this subject. Well together with your authorization let me to grab your sustain to stay up with the latest with approaching post.